I have posted this recipe before, way back in the mists of time. It is an excellent recipe and I cook it frequently. I cooked it about an hour ago in fact. Which was when I realised that I have changed a few things about it. Not in essentials but simply in the method to make it easier, quicker and with less washing up! I vary between serving them with melted butter, maple syrup and whipped cream (squirty from a can usually) and substituting the maple syrup for blueberry conserve. Today I discovered what a fabulous addition strawberries make. You can, of course, serve them however you like. What you have here is a deep, fluffy pancake that makes a perfect weekend breakfast or brunch. Makes 6 small pancakes, 3 largeish ones. – Measure out the milk in a large jug. – Add the egg and whisk together. – Add the melted butter and whisk to combine. – Place the jug on your scales and add the flour then the baking powder, salt and sugar. – Beat until well combined with no lumps. – If the mixture is a little thick then add a tbsp more milk until you reach the desired consistency. The mixture needs to be thick but move. 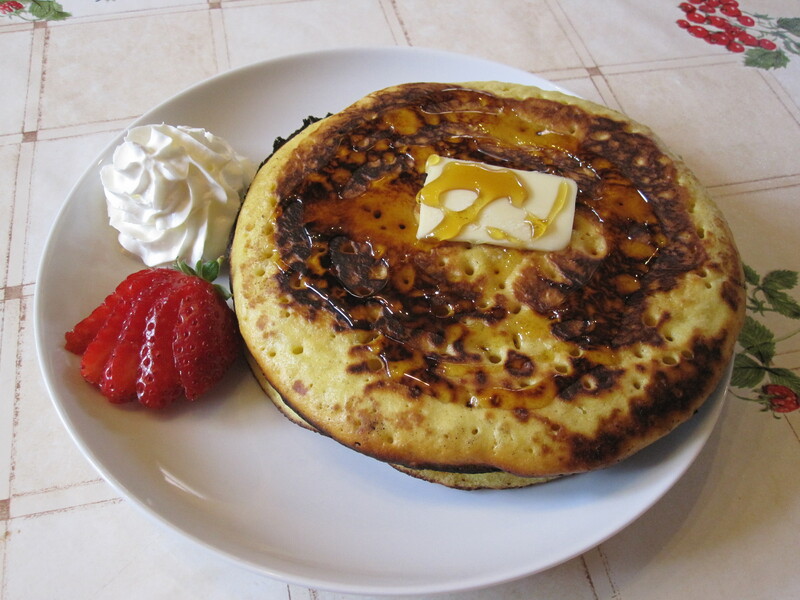 – Carefully pour the batter into the pan and wait until you see bubbles rising all over the pancake before flipping it using a spatula. – Cook until golden brown on both sides. – Repeat until all the mixture is gone. Thisngs are looking good for my big surprise but I don’t want to count my chickens just yet! In the meantime I have more news and, finally a new recipe! First in the news I have finally found myself a house to rent! I love living with my parents (and dog) but I’m really looking forward to making my own home and kitchen. I’m also slightly terrified, it’s a big step, but one that’s long overdue. It’ll be a busy few months I think but I’m going to do my best to keep posting regularly throughout any upheaval. My dad has recently been diagnosed with diabetes so we’re trying to eat as healthily as possible. This recipe, in its original form, came from a diabetic recipe site. All I can say is that it’s very tasty! – Heat a large casserole or pan on the hob. – Add the bacon and fry until just starting to crisp. – Remove from the pan and set aside. 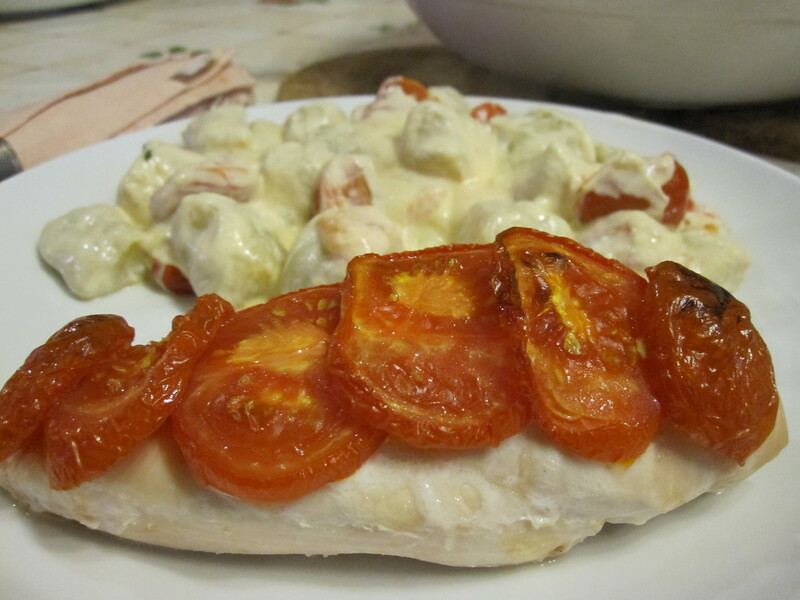 – Add the chicken breasts and cook for a few minutes on each side until browned. – Add the onion, garlic and peppers and cook for 5 minutes. – Add the beans, tomatoes, puree, stock and marjoram. – Stir well to combine. 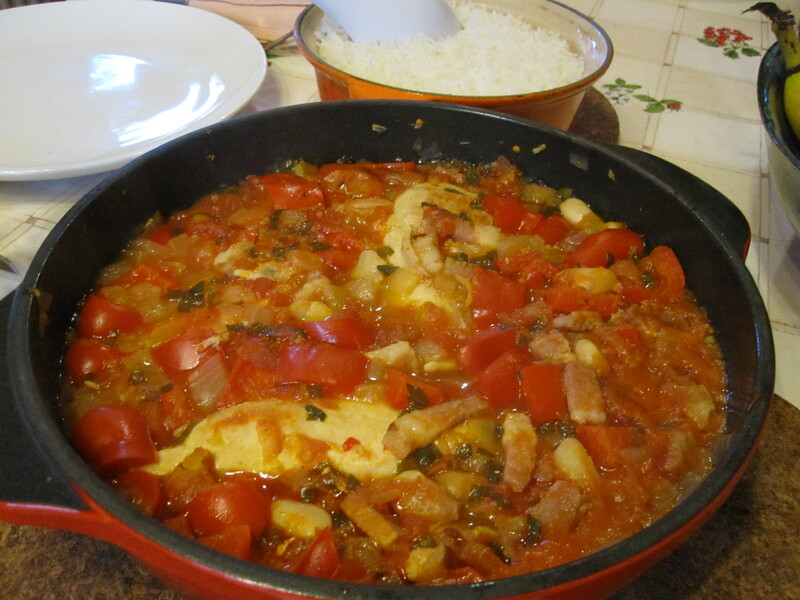 – Put the chicken and bacon back in the pan and cover with the rest of the ingredients. – Simmer for 45 minutes. 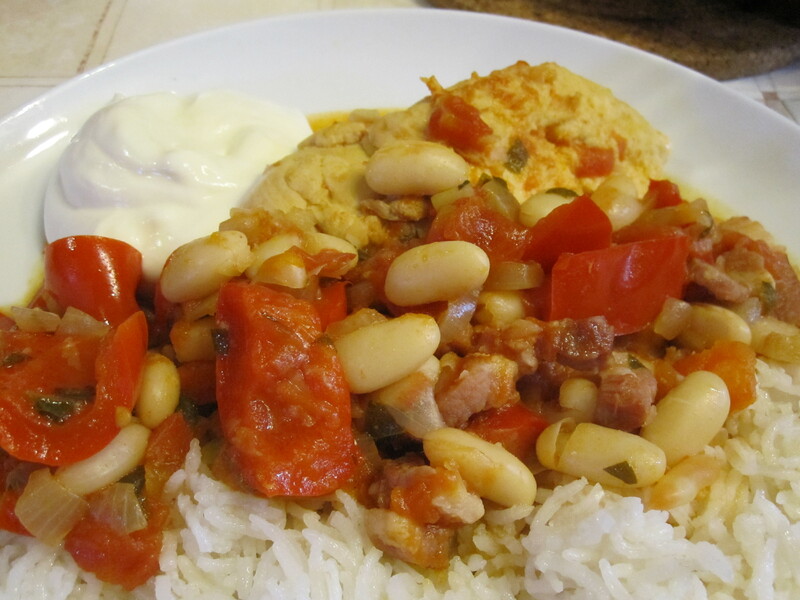 – Serve with basmati rice and creme fraiche. I’m afraid I’ve been neglecting you all recently and I really wanted to post something, anything! 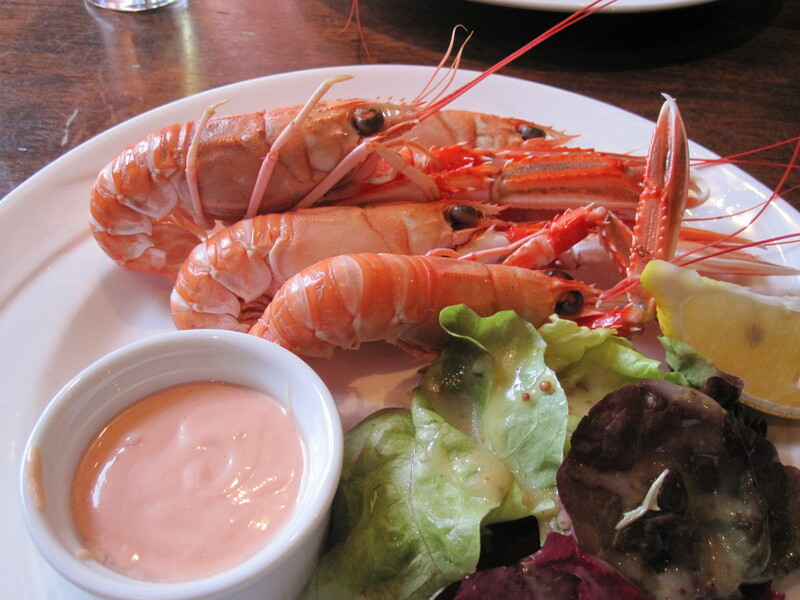 I’ve just been really busy, last week I went up to the west coast of Scotland, where I ate loads of seafood but didn’t actually cook anything. And this week I’ve been working on something special but I don’t want to jinx it just yet. All fingers and toes crossed, I may have some exciting news to come and if I don’t have news I’ll at least have a good story! 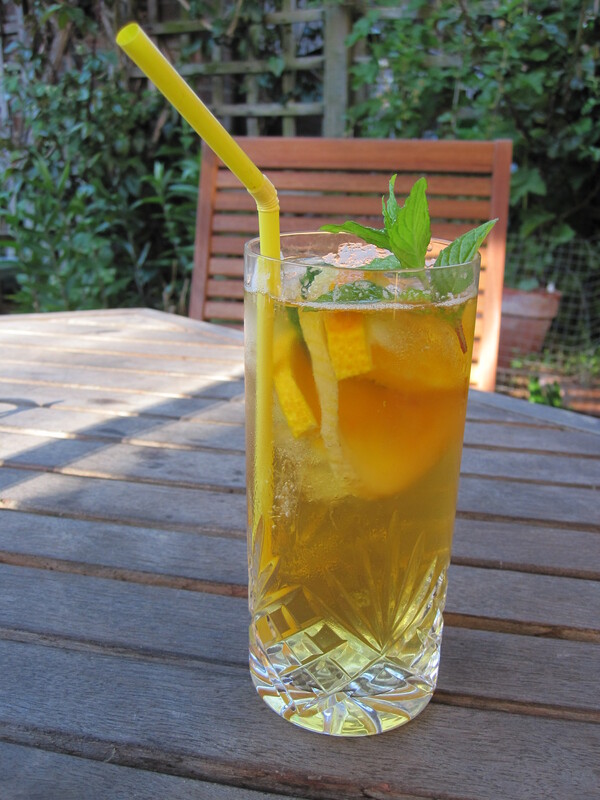 In the meantime I give you that perenial British summer favourite, for it really is summer at last, Pimms! Serves however many you like! – Pour a decent splash of Pimms in the bottom of a glass. – Add ice, sliced lemon, orange and cucumber. – Top up with lemonade or tonic water. – Add a sprig of mint. 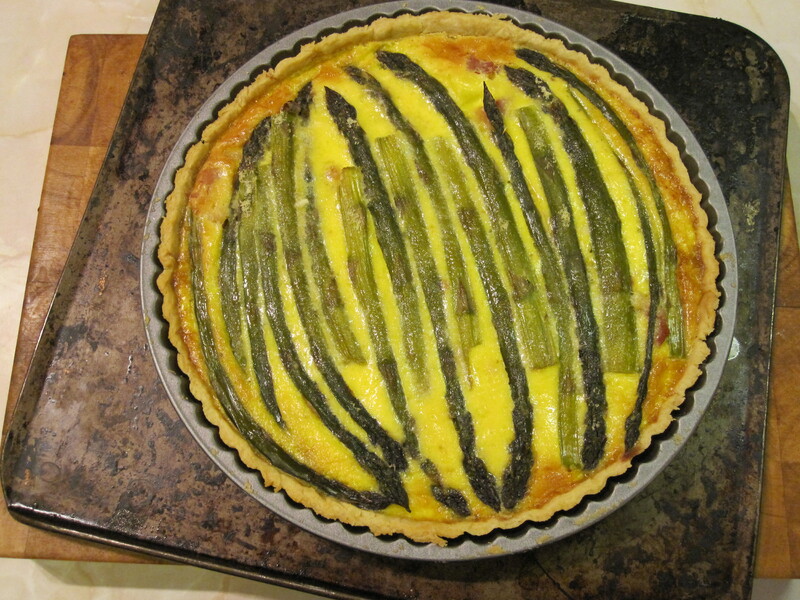 Since I kept seeing various recipes for tartes/flans/quiches with lovely lines of asparagus across the top I caved in and made one. (Such a sacrifice!) British asparagus is kicking off up here in Yorkshire now so I’m more than happy to indulge for a bit! Throwing together a quiche of any kind is easy. You make a pastry case, cook off some fillings and fill with egg and cream. Simples! 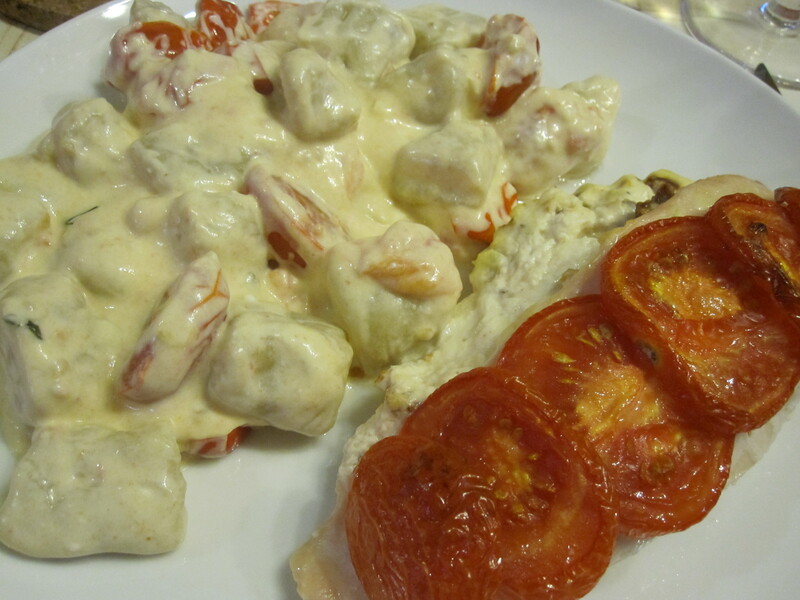 It’s one of the most easily adaptable dishes and that goes of occasion as well as contents. I’m very partial to a breakfast quiche, you can serve it as a fancy starter, a lunch box staple, a picnic food or even a main evening meal. The contents can be anything you have in your fridge, mushrooms and bacon are a staple in this house so that’s usually what we put in a quiche, but anything goes! – Rub in the butter and Trex with your fingers until it looks like breadcrumbs. – Sprinkle most of the cold water evenly over the mixture and mix in with either your hands or a flat bladed knife, adding more water if necessary to bring it together. – Bring it together in a ball and then press into a flat disc. – Wrap in plastic and chill in the fridge for at least 30 minutes. – Heat the oven to gas mark 6 with a flat baking tray in to heat. – Roll out on a lightly floured work surface until big enough to line a 23cm loose bottomed flan tin. – Carefully line the tin, patching any holes and pressing to fit the tin. – Trim the excess dough from the sides. – Line with foil and fill with baking beans. – Place on the preheated baking sheet and bake for 15 minutes. – Cook off the bacon in a frying pan and steam the asparagus for 4 minutes. – Remove from the oven and take out the baking beans and remove the foil. – Scatter the bacon over the pastry case. – Beat together the cream and eggs and pour into the pastry case. 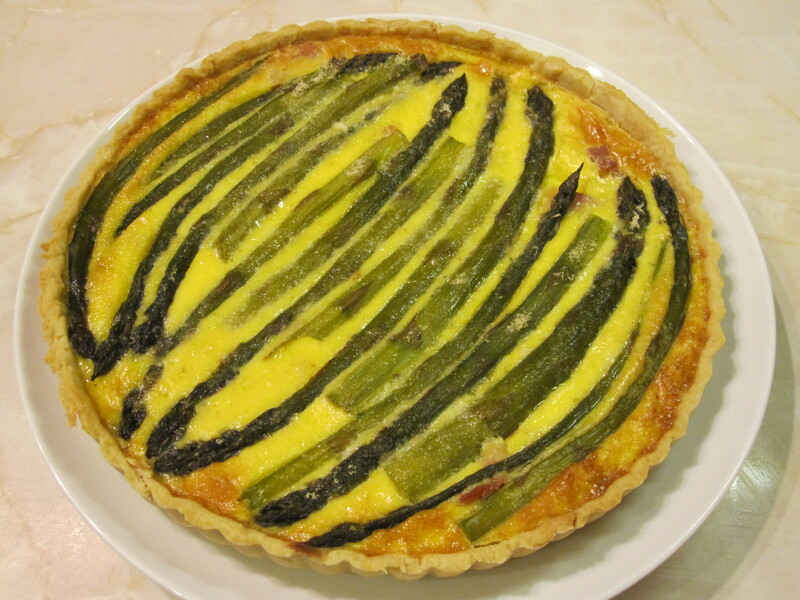 – Gently lay the asparagus over the top of the egg. – Scatter the whole thing with parmesan. – Put it back in the oven and bake for 15 minutes. – Turn down the heat to gas mark 4 and bake for another 10 minutes. – Check to see that the egg is just set in the centre and turn off the oven if it is, if not then give it another few minutes. – Either remove from the oven or leave to cool in the oven. – Slice and serve however you wish. When I saw a picture of these I was instantly smitten! How cute are they? However, I didn’t really want to make chocolate ones as I was in the mood for something simpler and I didn’t want to make the 30 the recipe said. So I basically took the picture and then went my own way with the recipe entirely. I’m actually pretty pleased that I am at the stage with my cooking and baking where I can confidently do that. I’ve always been one of those cooks who sees a recipe as more of a guideline than a rule but with baking you have to be much more careful as a little change can make a big difference. I’m happy to say that my changes produced a lovely biscuity biscuit. Warm from the oven they are sublime and the simplicity is exactly what I wanted. Nothing fancy of faffy, just a plain old delicious biscuit. And have I mentioned how cute I think they are? Oh, I have? Oops! – In a medium sized mixing bowl cream together the butter and the sugar until light and fluffy. – Add the egg yolk and mix in thoroughly. – Sift in the flour and salt. – Stir until combined into a soft dough. – Bring the dough together with your hands. – Wrap in clingfilm or a plastic bag and chill in the fridge for 30-60 minutes. – Heat the oven to gas mark 5 and line 2 large baking trays. 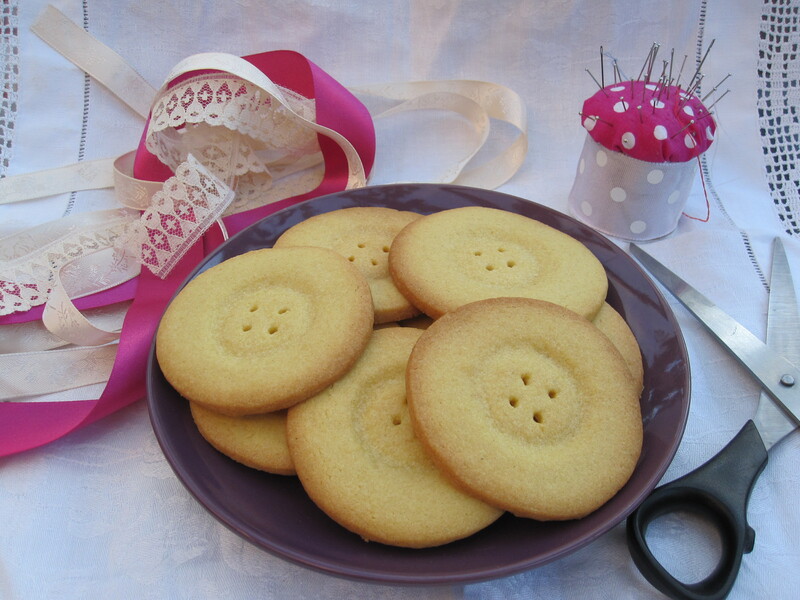 – Cut out 5cm rounds and carefully lift them onto the prepared trays. – If necessary chill the excess dough before rerolling it. – Using a shot glass of bottle cap press down to create a dip in the centre of the circle. – Use a tooth pick or small skewer to create 4 small holes. – Bake for 10 minutes near the top of the oven but be careful not to let them burn. Take them out before they start to brown. – Let them stand for 5 minutes on the trays then remove them to a cooling rack and try not to eat them all at once! ** We keep the plastic sheeting that comes around ready rolled icing and marzipan for this job.